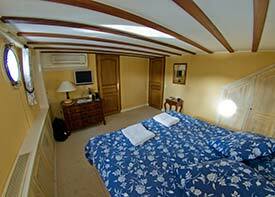 ABOVE: A fisheye view of Hugo, one of the four large staterooms on La Renaissance. INSET BELOW: Another cabin view, the bathroom, and a daytime peek through a porthole. Barge cabins tend to be more cozy than spacious, but the staterooms on La Renaissance--dubbed "suites" by European Waterways--are huge by the standards of most barges and river cruisers. The bow and stern suites ("Voltaire" and "Molière") measure 270 square feet or 25 m², while the two suites in the middle of the barge ("Hugo" and "Dumas") are only slightly smaller at 260 square feet or 24 m². Each cabin has beds that can be arranged as twin or king-size beds, plus a dresser, a small table, and built-in nightstands. (The bow and stern cabins also have chairs.) Closet space is generous, with plenty of room for clothing and luggage, and the bathrooms are larger than their counterparts on some oceangoing cruise ships. Bathroom floors are made of teak (with ceramic tile in the toilet areas), and the shower enclosures are fairly roomy, with curved polycarbonate doors. Toiletries are by L'Occitane de Provence; each cabin also comes with an electric hair dryer and two bathrobes. The central heating works well in chilly weather, but we woke up sweltering one night after the crew cranked up the heat instead of suggesting that a cold passenger add a second blanket. On the plus side, the wall-mounted air-conditioning unit is controlled individually by a remote device next to the bed, and we had no problem cooling our stateroom on warm, sunny days. Our only real complaint was with the twin portholes, which had only thin curtains instead of lined blackout curtains or screw-down covers. If you're a light-sensitive sleeper, you might want to bring an eye mask.